If the magnificent spectacle of the Northern Lights could be summed up in one single word it would be Colors. 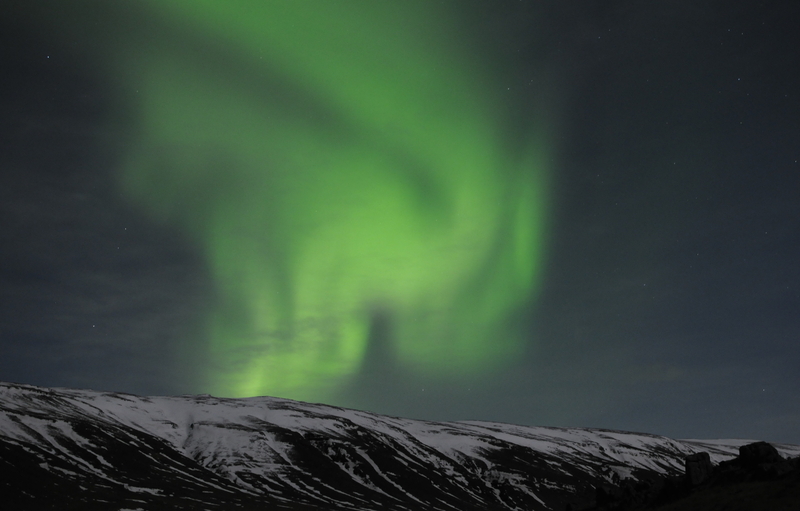 The powerful light-show that graces the skies of the Far North indeed takes several forms and many colors, each one even more beautiful than its predecessors. Today we will be looking at the different shades of the luminescent Aurora. To start with, most people would associate the Northern Lights with the color green. The color green is indeed by far the most common color to appear in Northern Lights pictures and this since the beginning of Aurora photography. However, the intensity of the green color is often not as powerful seen with naked eyes as when seen through a camera lens. Indeed, the bright, almost neon-green color of the pictures correspond most of the time to a somewhat paler hue appearing in the skies. 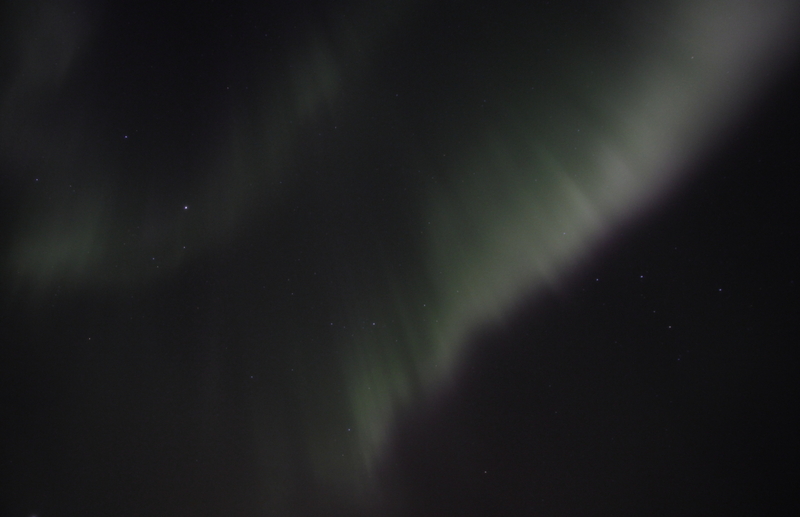 The Bright Green of the Aurora is something that mostly exists in the memory cards of digital cameras. The green color that can be experienced in nature is indeed rarely as flashy as photographs could make one believe. There are two main reasons for that: 1) Most Northern Lights pictures are taken with a long-exposure shot, which can create much brighter and more saturated pictorial representation of an otherwise much darker scene. 2) The human eye is sadly not able to pick up colors very well in low-light conditions. Camera lens don’t discriminate their capture of color in such a manner and as a result night-time pictures of the Aurora almost systematically feature more saturated colors than what can be seen in real life. The green of the Aurora tends then to liken either Emerald or… Artichoke! Colors of the Northern Lights are generally not as saturated when looked at with bare eyes. 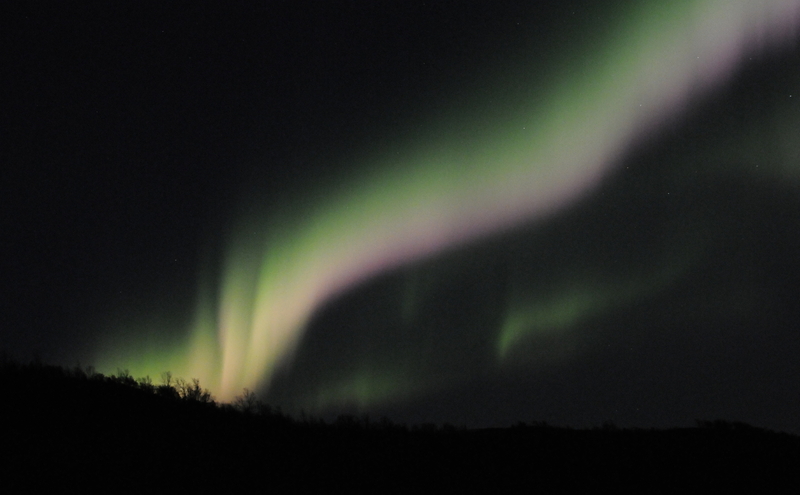 But when the Aurora gets more powerful, the lower parts of the Auroral formation tends to become saturated with color. It might take a more yellowish/brownish color but this state is simply transitory as the next step is most often the birth of a thin stripe of purple under the greener top. This violet band most often appears as a pale plume of lavender and pearly purple shinning brightly during the strongest moments of an Auroral show. This beautiful light is however very fickle and is most of the time observed for less than twenty seconds at most so for once it is often easier to see it with naked eyes than taking a picture of it. 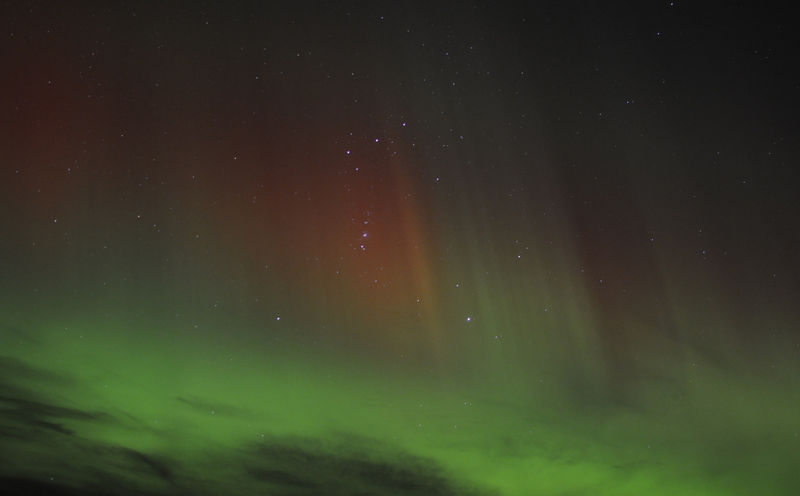 In some even rarer cases, the Aurora can develop a red or reddish upper-part. This colorful light, generally appearing on the top of band-shaped Northern Lights can quite frequently be photographed using a very long exposure time (generally close to thirty seconds). In these cases, this upper red coloring cannot really be seen with naked eye. However, when extremely powerful Auroras are unleashed, it might become visible for some time; still, as is the case for other colors, the red of the Northern Lights appears somewhat differently with the naked eye and on the camera. On pictures, we’re talking about bright, blood red, but with the naked eye the color is significantly darker and somewhat brownish, a bit like Carmine. 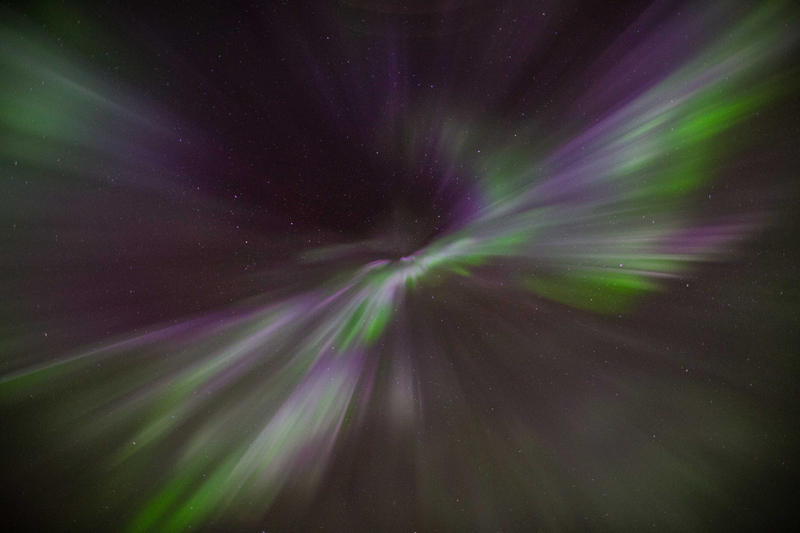 (5) Picture of a Corona near Tromsø. Ⓒ The Northern Lights Blog (2015).